This was a beautiful winter day in February to be out and about in Rocky Mountain National Park. The snow was falling hard, the wind was blowing and it was cold. Even so, the animals of Rocky Mountain National Park lead a difficult exsistence come wintertime. Once the snows cover the landscape of Rocky Mountain National Park, food is scare and the conditions can be forboding. Even so, the Elk of Rocky Mountain National Park endure. On this day I was in Horseshoe Park watching a group of nearly thrity Bull Elk waiting the storm out in the meadow. As the storm picked up in intensity, a group of four Bull Elk got up and walked across Horseshoe Park towards the shelter of the tree's. As I watched these magnificent creatures wade through the deep snow in a straight line I could not help but to hear Johnny Cash's song 'Walk the Line' playing in my head while I photographed the scene. 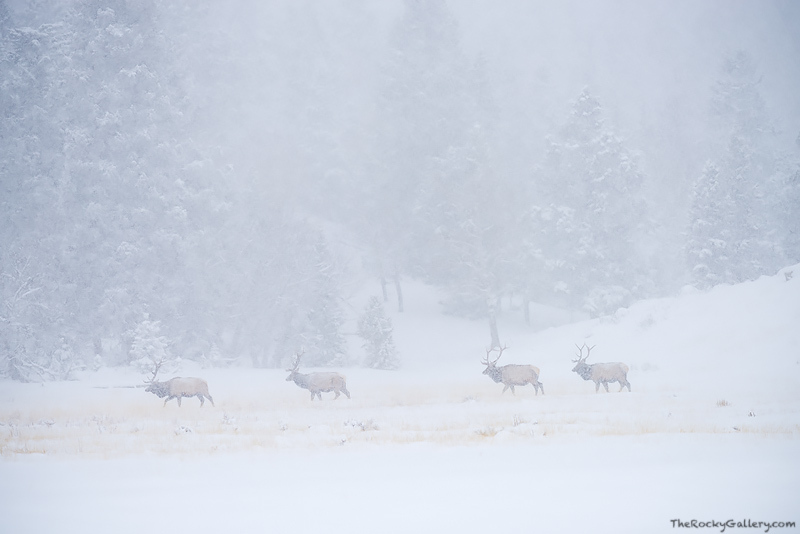 Watching these four Elk 'Walk the Line' through these trying conditions was both a haunting and inspirational experience for me. Photo © copyright by Thomas Mangan.